Long before Alien3 was even a glint in director David Fincher's eye, Dark Horse Comics was already crafting a terrifying post-Aliens continuity for Ripley, Hicks, and Newt. These are the original stories that took the comics market by storm in a prestige collection of the unabridged and unadulterated series. 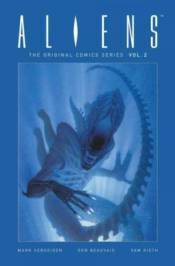 Collects Aliens: Nightmare Asylum #1-#4 and Aliens: Female War #1-#4.